We’re going to do a very interesting piece of math here. It’s going to bring a lot of things together. The key idea is to present a mathematical construct that effectively presents the electromagnetic force as one force, as one physical reality. Indeed, we’ve been saying repeatedly that electromagnetism is one phenomenon only but we’ve been writing it always as something involving two vectors: he electric field vector E and the magnetic field vector B. Of course, Lorentz’ force law F = q(E + v×B) makes it clear we’re talking one force only but… Well… There is a way of writing it all up that is much more elegant. I have to warn you though: this post doesn’t add anything to the physics we’ve seen so far: it’s all math, really and, to a large extent, math only. So if you read this blog because you’re interested in the physics only, then you may just as well skip this post. Having said that, the mathematical concept we’re going to present is that of the tensor and… Well… You’ll have to get to know that animal sooner or later anyway, so you may just as well give it a try right now, and see whatever you can get out of this post. So… Well… Here we go. Let me start with it all by reminding you of the concept of a vector, and why we like to use vectors and vector equations. What’s a vector? You may think, naively, that any one-dimensional array of numbers is a vector. But… Well… No! 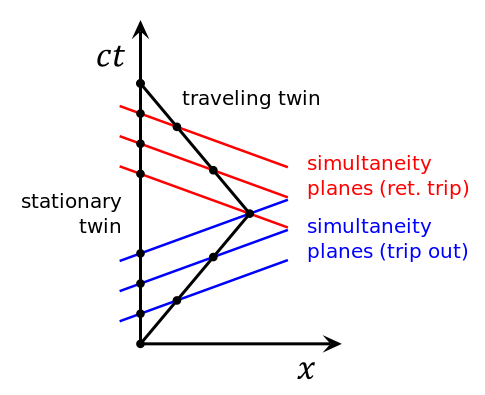 In math, we may, effectively, refer to any one-dimensional array of numbers as a ‘vector’, perhaps, but in physics, a vector does represent something real, something physical, and so a vector is only a vector if it transforms like a vector under the transformation rules that apply when going from one another frame of reference, i.e. one coordinate system, to another. Examples of vectors in three dimensions are: the velocity vector v, or the momentum vector p = m·v, or the position vector r.
Needless to say, the same can be said of scalars: mathematicians may define a scalar as just any real number, but it’s not in physics. A scalar in physics refers to something real, i.e. a scalar field, like the temperature (T) inside of a block of material. In fact, think about your first vector equation: it may have been the one determining the heat flow (h), i.e. h = −κ·∇T = (−κ·∂T/∂x, −κ·∂T/∂y, −κ·∂T/∂z). It immediately shows how scalar and vector fields are intimately related. We also have a displacement four-vector, which we can write as ΔR = (c·Δt, Δr). There are other four-vectors as well, including the four-velocity, the four-momentum and the four-force four-vectors, which we’ll discuss later (in the last section of this post). So it’s just like using three-dimensional vectors in three-dimensional physics, or ‘Newtonian’ physics, I should say: the use of four-vectors is going to allow us to write the laws of physics using vector equations, but in four dimensions, rather than three, so we get the ‘Einsteinian’ physics, the real physics, so to speak—or the relativistically correct physics, I should say. And so these four-dimensional vector equations will also not change when going from one reference frame to another, and so our four-vector will be vectors indeed, i.e. they will transform like a vector under the transformation rules that apply when going from one another frame of reference, i.e. one coordinate system, to another. What transformation? Well… In Newtonian or Galilean physics, we had translations and rotations and what have you, but what we are interested in right now are ‘Einsteinian’ transformations of coordinate systems, so these have to ensure that all of the laws of physics that we know of, including the principle of relativity, still look the same. You’ve seen these transformation rules. We don’t call them the ‘Einsteinian’ transformation rules, but the Lorentz transformation rules, because it was a Dutch physicist (Hendrik Lorentz) who first wrote them down. So these rules are very different from the Newtonian or Galilean transformation rules which everyone assumed to be valid until the Michelson-Morley experiment unequivocally established that the speed of light did not respect the Galilean transformation rules. Very different? Well… Yes. In their mathematical structure, that is. Of course, when velocities are low, i.e. non-relativistic, then they yield the same result, approximately, that is. However, I explained that in my post on special relativity, and so I won’t dwell on that here. Let me just jot down both sets of rules assuming that the two reference frames move with respect to each other along the x- axis only, so the y- and z-component of u is zero. The Galilean or Newtonian rules are the simple rules on the right. Going from one reference frame to another (let’s call them S and S’ respectively) is just a matter of adding or subtracting speeds: if my car goes 100 km/h, and yours goes 120 km/h, then you will see my car falling behind at a speed of (minus) 20 km/h. That’s it. We could also rotate our reference frame, and our Newtonian vector equations would still look the same. As Feynman notes, smilingly, it’s what a lot of armchair philosophers think relativity theory is all about, but so it’s got nothing to do with it. It’s plain wrong! So how does this thing behave under a Galilean transformation? Well… You may or may not remember that we used this cross-product to define the angular momentum L, which was a cross product of the radius vector r and the momentum vector p = mv, as illustrated below. The animation also gives the torque τ, which is, loosely speaking, a measure of the turning force: it’s the cross product of r and F, i.e. the force on the lever-arm. But so… Well… We’re actually getting a bit of a heads-up here: if we’d be mixing (or ‘crossing’) polar and axial vectors, or mixing axial vectors only, so if we’d define something involving L and p (rather than r and p), or something involving L and τ, then we may not be so lucky, and then we’d have to carefully examine our cross-product, or whatever other product we’d want to define, because its components may not behave like a vector. Huh? Whatever other product we’d want to define? Why are you saying that? Well… We actually can think of other products. For example, if we have two vectors a = (ax, ay, az) and b = (bx, by, bz), then we’ll have nine possible combinations of their components, which we can write as Tij = aibj. So that’s like Lxy, Lyz and Lzx really. Now, you’ll say: “No. It isn’t. We don’t have nine combinations here. Just three numbers.” Well… Think about it: we actually do have nine Lij combinations too here, as we can write: Lij = ri·pj – rj·pi. It just happens that, with this definition, only three of these combinations Lij are independent. That’s because the other six numbers are either zero or the opposite. Indeed, it’s easy to verify that Lij = –Lji , and Lii = 0. So… Well… It turns out that the three components of our L = r×p ‘vector’ are actually a subset of a set of nine Lij numbers. So… Well… Think about it. We cannot just do whatever we want with our ‘vectors’. We need to watch out. There is a thing which we call the angular momentum tensor. It’s a 3×3 matrix, so it has nine elements which are defined as: Lij = ri·pj – rj·pi. Because of this definition, it’s an antisymmetric tensor of the second order in three dimensions, so it’s got only three independent components. In fact, in four dimensions, we’ll use a similar definition and define 16 elements Fij as Fij = ∇iAj − ∇jAi, using the two four-vectors ∇μ and Aμ (so we have 4×4 = 16 combinations indeed), out of which only six will be independent for the very same reason: we have an antisymmetric vector combination here, Fij = −Fji and Fii = 0. 🙂 However, because we cannot represent six independent things by four things, we do not get some other four-vector, and so that’s why we cannot apply the same ‘trick’ in four dimensions. So you don’t have that under a Galilean transformation: in the Newtonian world, space and time are neatly separated, and time is absolute, i.e. it is the same regardless of the reference frame. In Einstein’s world – our world – that’s not the case: time is relative, or local as Hendrik Lorentz termed it quite appropriately, and so it’s space-time – i.e. ‘some kind of union of space and time’ as Minkowski termed it – that transforms. So that’s why physicists use four-vectors to keep track of things. These four-vectors always have three space-like components, but they also include one so-called time-like component. It’s the only way to ensure that the laws of physics are unchanged when moving with uniform velocity. Indeed, any true law of physics we write down must be arranged so that the invariance of physics (as a “fact of Nature”, as Feynman puts it) is built in, and so that’s why we use Lorentz transformations and four-vectors. So now you can just put in the numbers now: vx = (0.5c + 0.5c)/(1 + 0.5·0.5) = 0.8c. See? They’re much easier to remember and work with, and so that’s good, because now we need to look at how these rules work with four-vectors and the various operations and operators we’ll be defining on them. Let’s look at that step by step. The solution for Maxwell’s equations is given in terms of the (electric) potential Φ and the (magnetic) vector potential A. I explained that in my post on this, so I won’t repeat myself too much here either. The only point you should note is that this solution is the result of a special choice of Φ and A, which we referred to as the Lorentz gauge. We’ll touch upon this condition once more, so just make a mental note of it. Aμ = (Φ, A) = (Φ, Ax, Ay, Az) = (At, Ax, Ay, Az) with At = Φ. So that’s a four-vector just like R = (ct, x, y, z). How do we know that Aμ is a four-vector? Well… Here I need to say a few things about those Lorentz transformation rules and, more importantly, about the required condition of invariance under a Lorentz transformation. So, yes, here we need to dive into the math. is an invariant under a Lorentz transformation. We found the same for the so-called spacetime interval Δs2 = Δr2 – cΔt2, which we write as Δs2 = Δr2 – Δt2 as we chose our time or distance units such that c = 1. [Note that, from now on, we’ll assume that’s the case, so c = 1 everywhere. We can always change back to our old units when we’re done with the analysis.] Indeed, such invariance allowed us to define spacelike, timelike and lightlike intervals using the so-called light cone emanating from a single event and traveling in all directions. at‘2 – ax‘2 – ay‘2 – az‘2 = at2 – ax2 – ay2 – az2. [The primed quantities are, obviously, the quantities as measured in the other reference frame.] So. Well… Yes. 🙂 But… Well… Hmm… We can say that our four-potential vector is a four-vector, but so we still have to prove that. So we need to prove that Φ’2 – Ax‘2 – Ay‘2 – Az‘2 = Φ2 – Ax2 – Ay2 – Az2 for our four-potential vector Aμ = (Φ, A). So… Yes… How can we do that? The proof is not so easy, but you need to go through it as it will introduce some more concepts and ideas you need to understand. Now, that’s a function representing a wave traveling at speed c, i.e. the phase velocity. Always? Yes. Always! It’s got to do with the x − ct and/or x + ct argument in the function. But, sorry, I need to move on here. Just to make sure, let me remind you that Aμ = (Φ, A) and that jμ = (ρ, j). Now, our new D’Alembertian operator is just an operator—a pretty formidable operator but, still, it’s an operator, and so it doesn’t change when the coordinate system changes, so the conclusion is that, IF jμ = (ρ, j) is a four-vector – which it is – and, therefore, transforms like a four-vector, THEN the quantities Φ, Ax, Ay, and Az must also transform like a four-vector, which means they are (the components of) a four-vector. Aμ = (Φ, A) is a four-vector. We call it the four-potential vector. What about it? Well… You should note that the physics of that equation is just the same as Maxwell’s equations. So it’s one equation only, but it’s got it all. It’s quite a pleasure to re-write it in such elegant form. Why? Think about it: it’s a four-vector equation: we’ve got a four-vector on the left-hand side, and a four-vector on the right-hand side. Therefore, this equation is invariant under a transformation. So, therefore, it directly shows the invariance of electrodynamics under the Lorentz transformation. 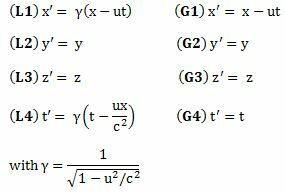 It’s referred to as the Lorentz condition and it is, effectively, a condition for invariance, i.e. it ensures that the four-vector equation above does stay in the form it is in for all reference frames. Note that we’re re-writing it using the four-dimensional equivalent of the divergence operator ∇•, but so we don’t have a dot between ∇μ and Aμ. In fact, the notation is pretty confusing, and it’s easy to think we’re talking some gradient, rather than the divergence. So let me therefore highlight the meaning of both once again. It looks the same, but it’s two very different things: the gradient operates on a scalar, while the divergence operates on a (four-)vector. Also note the +−−− signature is only there for the gradient, not for the divergence! So now we can write: Bx = Fzy, By = Fxz, and Bz = Fxy. Now look at our equation for E. It turns out the components of E are equal to things like Fxt, Fyt and Fzt! Indeed, Fxt = ∂Ax/∂t − ∂At/∂x = Ex! So we’ve got a plus instead of a minus. It looks quite arbitrary but, frankly, you’ll have to admit it’s sort of consistent with our +−−− signature for our four-vectors and, in just a minute, you’ll see it’s fully consistent with our definition of the four-dimensional vector operator ∇μ = (∂/∂t, −∂/∂x, −∂/∂y, −∂/∂z). So… Well… Let’s go along with it. Now that matrix is referred to as the electromagnetic tensor and it’s depicted below (we plugged c back in, remember that B’s magnitude is 1/c times E’s magnitude). The other way to do it is to write the ∇μ = (∂/∂t, −∂/∂x, −∂/∂y, −∂/∂z) operator as a 4×1 column vector, which you then multiply with the four-vector Aμ written as a 4×1 row vector. So ∇μAμ is then a 4×4 matrix, which we combine with its transpose, i.e. (∇μAμ)T, as shown below. So what’s written below is (∇μAμ) − (∇μAμ)T.
So one should think of a tensor as “another kind of cross product” or, preferably, and as Feynman puts it, as a “generalization of the cross product”. 2. In this case, the four-vectors are ∇μ = (∂/∂t, −∂/∂x, −∂/∂y, −∂/∂z) and Aμ = (Φ, Ax, Ay, Az). Now, you will probably say that ∇μ is an operator, not a vector, and you are right. However, we know that ∇μ behaves like a vector, and so this is just a special case. The point is: because the tensor is based on four-vectors, the Fμν tensor is referred to as a tensor of the second rank in four dimensions. In addition, because of the Fij = – Fji result, Fμν is an asymmetric tensor of the second rank in four dimensions. 3. Now, the whole point is to examine how tensors transform. We know that the vector dot product, aka the inner product, remains invariant under a Lorentz transformation, both in three as well as in four dimensions, but what about the vector cross product, and what about the tensor? That’s what we’ll be looking at now. Cross products are complicated, and tensors will be complicated too. Let’s recall our example in three dimensions, i.e. 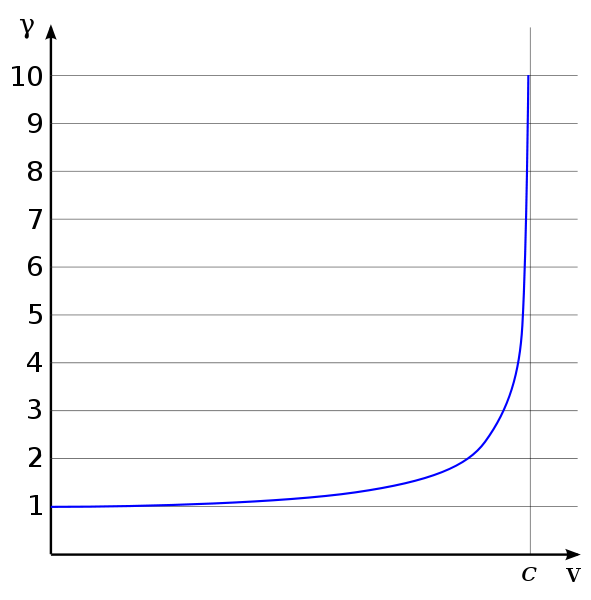 the angular momentum vector L, which was a cross product of the radius vector r and the momentum vector p = mv, as illustrated below (the animation also gives the torque τ, which is, loosely speaking, a measure of the turning force). So it’s a similar situation here. We have nine possible combinations, but only three independent numbers. So it’s a bit like our tensor in four dimensions: 16 combinations, but only 6 independent numbers. Now, it so happens that that these three numbers, or objects if you want, transform in exactly the same way as the components of a vector. However, as Feynman points out, that’s a matter of ‘luck’ really. In fact, Feynman points out that, when we have two vectors a = (ax, ay, az) and b = (bx, by, bz), we’ll have nine products Tij = aibj which will also form a tensor of the second rank (cf. the two indices) but which, in general, will not obey the transformation rules we got for the angular momentum tensor, which happened to be an antisymmetric tensor of the second rank in three dimensions. To make a long story short, it’s not simple in general, and surely not here: with E and B, we’ve got six independent terms, and so we cannot represent six things by four things, so the transformation rules for E and B will differ from those for a four-vector. So what are they then? The ‘perpendicular’ or ‘total transverse’ components E⊥ and B⊥, which are the vector sums of the y- and z-components. To lighten things up, let me insert an image of how the transformed field E actually looks like. The first image is the reference frame of a charge itself: we have a simple Coulomb field. The second image shows the charge flying by. Its electric field is ‘squashed up’. To be precise, it’s just like the scale of x is squashed up by a factor ((1−v2/c2)1/2. Let me refer you to Feynman for the detail of the calculations here. OK. So that’s it. You may wonder: what about that promise I made? Indeed, when I started this post, I said I’d present a mathematical construct that presents the electromagnetic force as one force only, as one physical reality, but so we’re back writing all of it in terms of two vectors—the electric field vector E and the magnetic field vector B. Well… What can I say? I did present the mathematical construct: it’s the electromagnetic tensor. So it’s that antisymmetric matrix really, which one can combine with a transformation matrix embodying the Lorentz transformation rules. So, I did what I promised to do. But you’re right: I am re-presenting stuff in the old style once again. Well… It is and it isn’t. We wanted to get away from those two vectors E and B, and show that electromagnetism is really one phenomenon only, and so that’s where the concept of the electromagnetic tensor came in. There were two objectives here: the first objective was to introduce you to the concept of tensors, which we’ll need in the future. The second objective was to show you that, while Lorentz’ force law – F = q(E + v×B) makes it clear we’re talking one force only, there is a way of writing it all up that is much more elegant. OK… Enough for today. Let’s follow up tomorrow.